Welcome to the Community Creativity area. This is where I collect others’ artistic creations that I love and appreciate – creations that I find and get permission to share or that people send to me. If you have anything you have created about your experiences with trauma and would like to share, just get in touch – my email is heidi maria hanson at gmail dot com. Our very first contribution is a beautiful poem called “My Eyes Still Work.” This poem is about the experience of living with dissociative identity disorder (DID), generously shared with us by Anna D’Jiata. You think because my brain is broke, that my eyes no longer see. But my eyes can see the way you look, cause you’re looking right through me. My eyes can see the way you stare, wondering who’s at hand. My eyes can see the way you doubt, who I really am. You think because my brain is broke, my heart won’t feel the burn. But my heart can grieve a thousand losses, that my head will never learn. My heart can love, unabashedly, no care and no concern. My heart can learn what my head can’t feel, cause it’s too broke to be concerned. You think because my brain is broke, I can’t hear what you’re trying to say. But my ears hear every word and they tuck every thought away. My ears can hear your whisper, as they hear your rolling eyes. My ears can hear your silence, and it is fear’s lullaby. You think because my brain is broke that I can’t understand. That I can’t somehow be reached, as if in a foreign land. 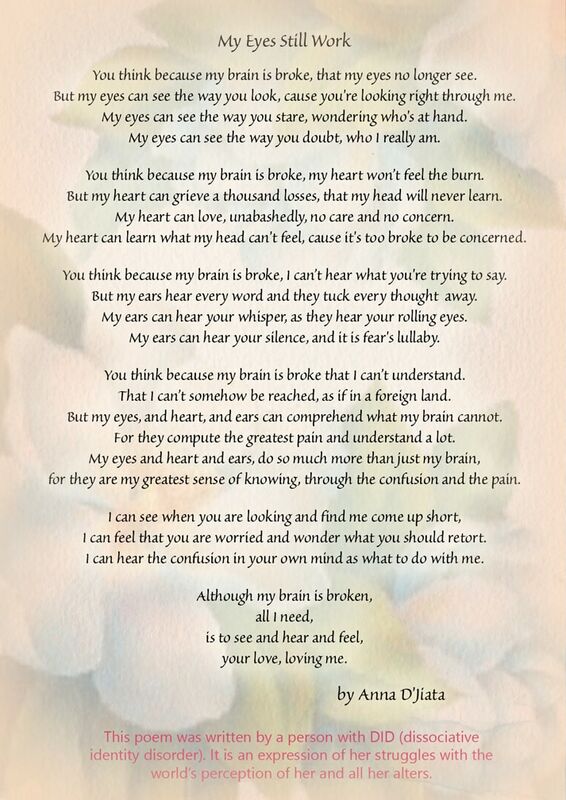 But my eyes, and heart, and ears can comprehend what my brain cannot. For they compute the greatest pain and understand a lot. for they are my greatest sense of knowing, through the confusion and the pain. I can feel that you are worried and wonder what you should retort. I can hear the confusion in your own mind as what to do with me. 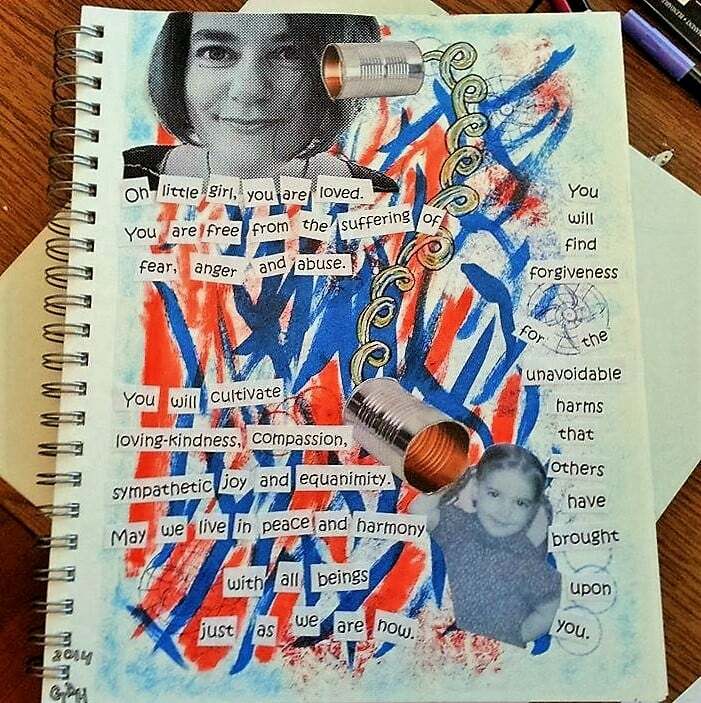 This poem was written by a person with DID (dissociative identity disorder). It is an expression of her struggles with the world’s perception of her and all her alters. When one person gives a voice to something it helps others find out if perhaps they have similar parts of themselves that want to say the same thing. Have you ever needed an escape? Little hands, little feet, little she can do. 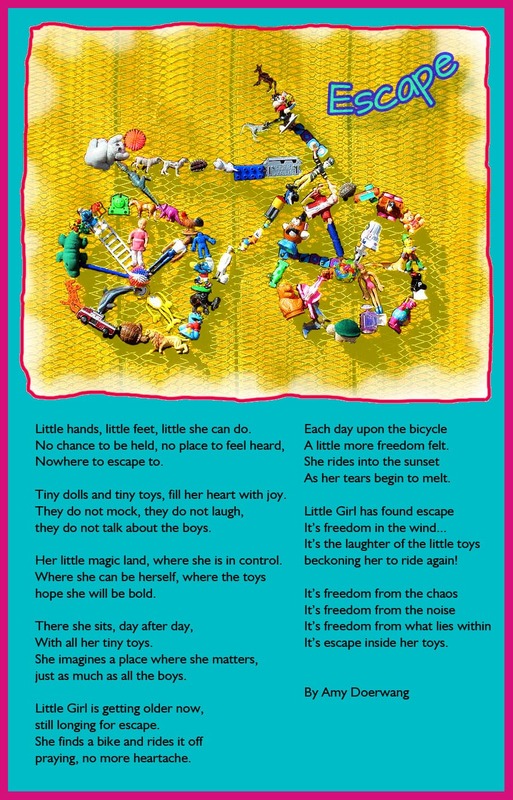 Tiny dolls and tiny toys, fill her heart with joy. they do not talk about the boys. Her little magic land, where she is in control. Where she can be herself, where the toys hope she will be bold. With all her tiny toys. just as much as all the boys. A little more freedom felt. As her tears begin to melt. beckoning her to ride again! It’s escape inside her toys. When I read this mantra I feel a powerful sense of connection to my inner child, and I feel an opening to the possibility of bringing peace and serenity into the turbulent and tumultuous world of childhood traumas. In this mindful loving kindness mantra, the link between the adult and child self is deep, confident and full of love. This connection is symbolized by the telephone – the smiling, shining confident adult is sending her message clearly through to the child who is attentively listening. The telephone line, colored gold, crosses right over many red and blue lines that look discordant – so it passes over allll the discord and frightening chaos, traumas and confusion, to give this little one the peace and hope that she so badly needs. The telephone line is the only gold or yellow element – gold is sometimes associated with the higher spirit/higher self and yellow can bring up ideas of light, insight, sunshine and happiness. Red sometimes is related to anger and blue sometimes is related to sorrow. This piece asks us – can you cultivate a direct way to talk and give love and loving words to the past younger self inside you, who may still be feeling all alone? Sometimes we don’t realize how much we as adults actually can give to the little child within, because we stay disconnected. Once the connection is made, it can dawn on us that we actually have a lot to give – we can give love, protection, comfort, words of kindness, listening and words of hope to that young vulnerable child. I feel a deep sense of renewed hope and strength, and a lot of care for my inner little one, when I read the mantra. By the way, mantras are supposed to be repeated while in a state of meditation. So this contribution relates to mindfulness practice as a form for enabling healing to take place. Mindfulness practices can enable deep healing because going into a trance state can open up parts of the unconscious mind. This mantra is a gentle and safe type of message to bring into a mindfulness practice. Thank you so much Ginger for your contribution. Oh little girl, you are loved. just as we are now. that others have brought upon you. A visitors centre has been constructed with a cafe, store and display of how the castle used to look before it was blown up within the late 1600s. Why this works: Guys who are kind to animals are hot, no question about it http://prostituiertetsinnrw.everysecond.info . Women like a man that may supply her security and take care of her. And let’s mention normal men out in the world, that don’t have a record deal as a famous Rapper, many men are disgusted by the appearance of other men in skirts in general especially Rappers in skirts busig berlin beste Date Seite Wahlhilfe fÃ¼r Landwirte: Der Agrar-O-Mat Haremhab 11. This is dating time, you take her out, have a nice laugh and then later you go for deep conversations. Countless songs have been written about them in about a week or so he may call to tell you that he is off all drugs and doing great. Healing from Trauma and PTSD - Nine Reasons NOT to Talk About "What Happened"
© 2019 The Art of Healing Trauma.